Student Physiotherapists taking their Electives in Mexico have an exciting experience. If you decide to take your Elective here, you will be placed in one of the busy Guadalajara city hospitals or in a school for disabled children, depending on your chosen specialism. Projects Abroad will help co-ordinate your trip to Mexico and will liaise with your university, making sure your placement fulfils their criteria. We are experienced in supporting elective students and our in-country staff are on hand to answer any questions and help with any paperwork you may have to complete before departure. In Mexico you will be allocated a qualified member of staff who will be your dedicated supervisor. They will ensure you have time with them to discuss case studies and they will answer any questions you may have. Your supervisor will be keen to help you gain valuable experience in the hospital. The City hospitals in Guadalajara are busy places. Make sure you take extensive notes throughout your time so you can refer back to them. As a physiotherapist on your elective, you will shadow existing staff when they treat patients. How much hands on work you get while on your placement in Mexico will not only depend on your experience but also on how much enthusiasm you show and how you integrate yourself into the team. In hospitals you could work with various cases including patients recovering from operations and stroke victims. You could also work in a school for children with disabilities. These children need focused one-to-one attention to help them with their motor skills, which will help improve the quality of their lives. Elective students need to speak some Spanish to join our Mexican Physiotherapy Elective project. If you are unsure as to whether your Spanish is good enough please give us a call. Many students who lack confidence in their Spanish language skills join a Teaching, Care, Community or Spanish Language project before joining their elective programme. This gives them the opportunity to brush up their language skills before the medical part of their placement. 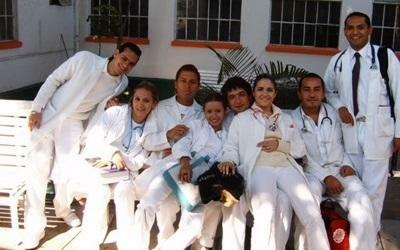 While completing your Physiotherapy Elective in Mexico you will live with local host families. Here you will be able to really improve your Spanish and immerse yourself in the Mexican way of life. You can explore Guadalajara on your days off with the very active Projects Abroad volunteer community. If you have any questions please call us on +44 (0) 1273 007230.